Password: ****** (the password we assign) - The password can be changed to any password you want to use, but we need to change it on the server to match - so let us know if you need to change it. Ports: Incoming will default to 995 when you check the box for server requires SSL. Outgoing needs to be manually set to 587 - This is an advanced setting under Account Properties. Choose STARTTLS for the type of encryption. 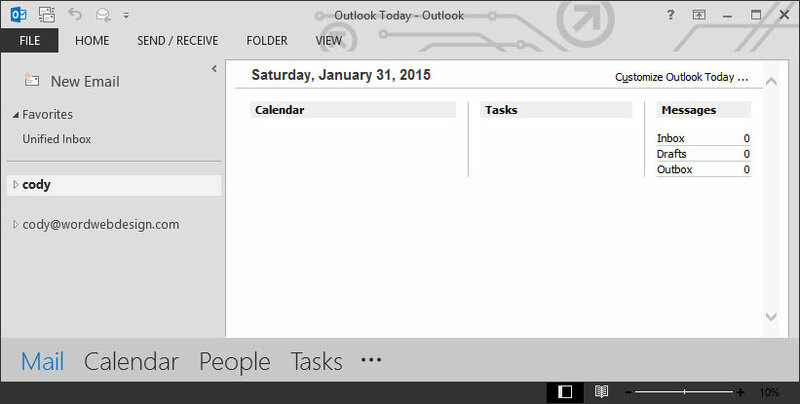 Note these directions are for one of the newer versions of Outlook. 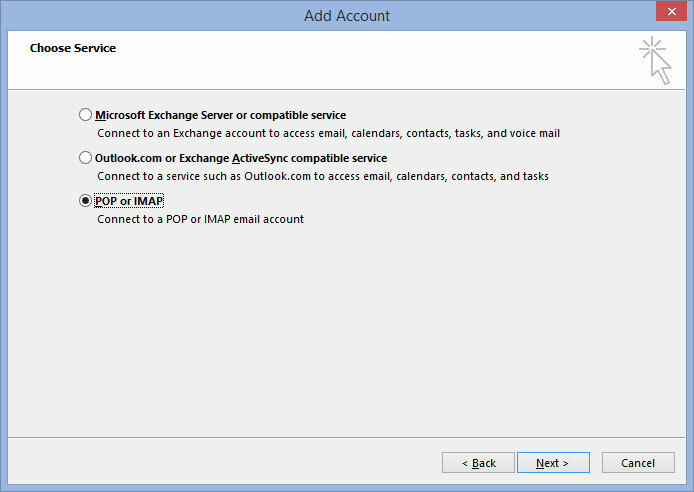 Older instructions are also available: Outlook 2010-2013, and the older Outlook Express. 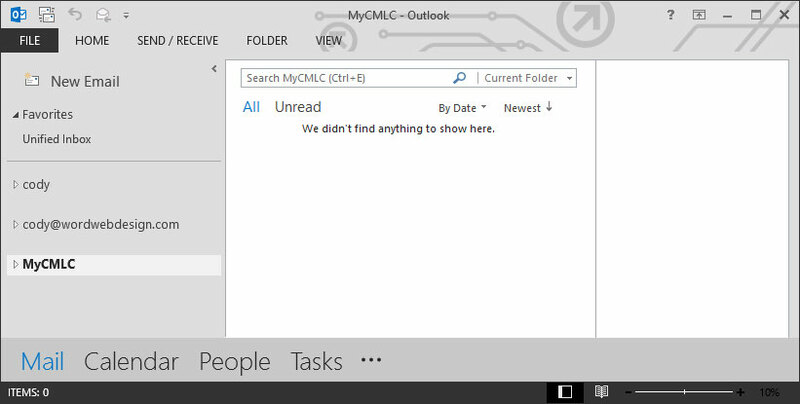 Open Outlook and click the File button in the upper-left hand corner. 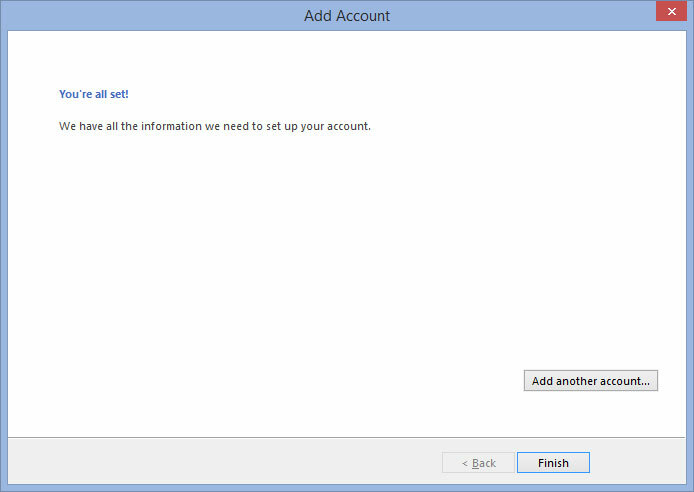 In the Info tab, click the Add Account button under Account Information. 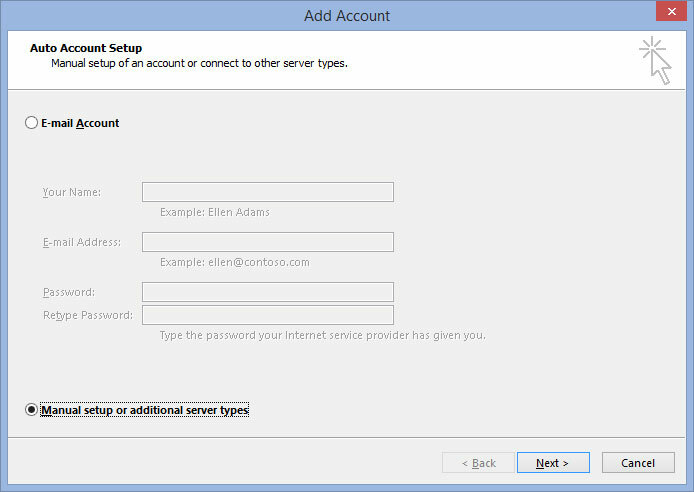 Check the Manual setup or additional server types button and click Next. 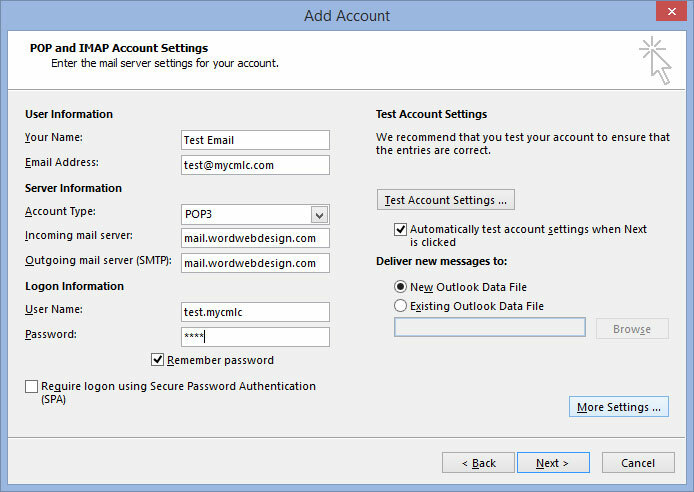 Check the POP or IMAP button and click Next. 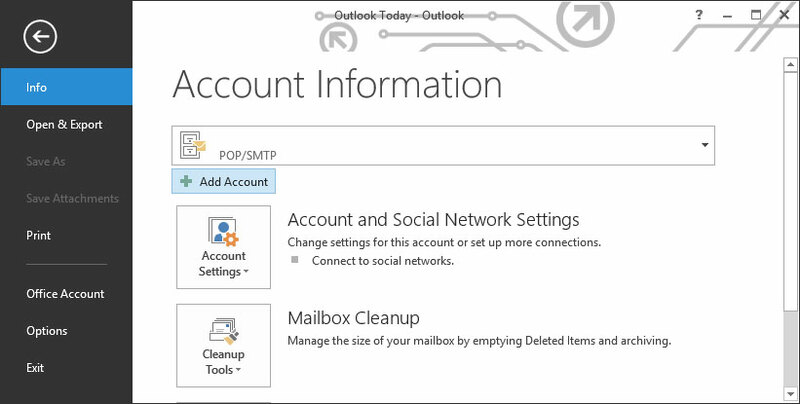 Under Mail Account, enter a name for your account that will show in Outlook when browsing your accounts. Then click on the Outgoing Server tab. 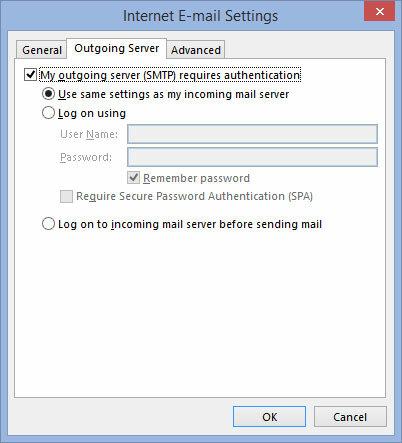 On the Outgoing Server tab, check the My Outgoing Server (SMTP) Requires Authentication box. Then click the Advanced tab. 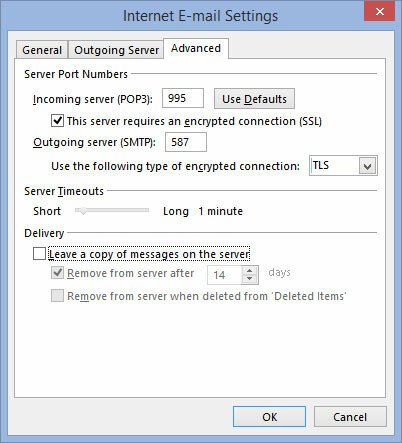 Set the Incoming Server (POP3) to 995, checking the box below it requiring encrypted connections. 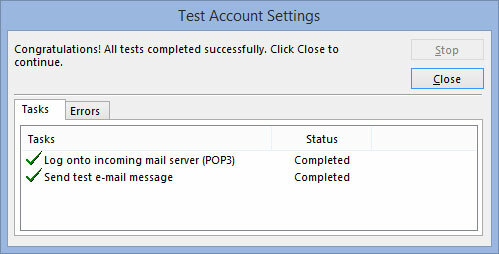 Then set the Outgoing Server (SMTP) to 587, setting the dropdown box just below that to TLS. 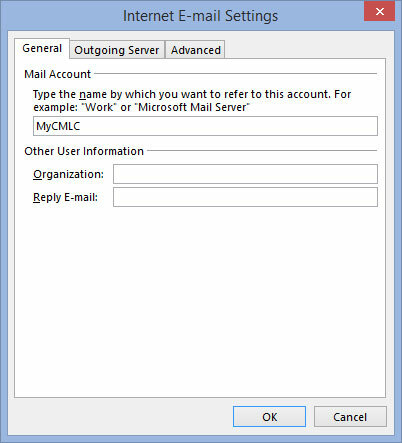 Uncheck the box that reads Leave A Copy Of Messages On The Server. Then click OK. If the test was successful, you’ll be taken to a final page telling you your account is up and running. Click Finish. You’ll be taken to the main page where you can now begin using your new setup email account! Questions? Call us at 503-869-4970. Thank you for choosing WORD Web Design for your e-mail needs.